I've been out in the gardens today, in my usual style, snip-snippety-snipping and a whistling away, pirouetting and a high kickin' through the borders, in search of the ultimate early summer treasure. It may have been a little grey outside but we huff in the face of cloudy skies here at Magical Manor, for I had my eyes fixed on a prize that exudes it's very own illustrious sunshine. After all the heavy rains, we have been gifted glorious waves of Technicolor gorgeousness this week. Armfuls upon armfuls of lush velvety roses with scents ranging from a citrus neroli to traditional old rose. I love to add them to vases as they come without over-fussing with them. The house is dotted with all manner of vases, urns, and receptacles, overflowing with these luscious beauties. June certainly is bustin' out all over... so grab your petticoats and join in. Your roses are gorgeous and thanks for the video from Carousel...whew! I'm "tuckered out" from all that dancin'. Paul, they are such beautiful roses. Like you, I feel they don't require much 'arranging', just the perfect vase. I'm crossing the pond tonight and will be sailing away on the Queen Victoria Thur. Perhaps tomorrow in Southampton I'll catch glimpses of English gardens brimming with roses……..in the rain by sound of it! Oh well, have a mac' with me just in case of course! What a great song to welcome the month of June. You roses sound fabulous and I love how you display them. Come and join us Helen, we've got morning vocal warm ups commencing at 9am, there's no better way to start the day than a good old sing-song! I am doing the same thing over my way, putting bouquets on every level surface! Love your beautiful roses and I bet they smell heavenly! I would love to see your bouquets Kat, I know they will be magnificent. June is truly a special month! It's the best month of the Year! Ha!ha! Your bunch of roses and citrus neroli are so beautiful. Hmmm they must smell so good all of over your house. They do smell divine Pamela, if only the temps were a little higher then the scents would be that much more stronger. Just gorgeous Paul! We too are enjoying armfuls of beautiful, scented roses here at home! Love the film clip….ha ha…brightened my start to the day! the roses are gorgeous! And though I can't complain about mine, I think of "the bunches" you are able to take in -- from my balcony I rob them one by one - having a lot of small vases now -- even one bunch would tear a huge hole. But "snip-snippety- snipping" is very necessary on a balcony too! Sir Paul! I have my petticoat ready and my lungs are filled with fresh air, so I'm ready to belt out a Broadway tune with YOU right now! I just came in from my garden where I am just waiting a couple more days to prune away at my sweet boxwood garden! It sounds like you are whistling, dancing and skipping away in your garden, and SO AM I! This is my last week of school and am I ever happy! I know you are having the best time at school and you've also got a well deserved break coming up, how about I send the egg over, to whisk you off to some magical destination?! I gasped, what a cornucopia of beauties, you really should come and sort my garden out, so much has died and this is an old house, I've been replanting, I now have a Barrett house garden - could weep. It looks like you have a strong evergreen backbone to the garden Tabitha. With some seasonal colour you can work the B&P magic back into the garden to replace what has been lost. I think Mum would be the person to advise if you are replanting, I am sure there are some favourites she has that would be perfect as new additions. 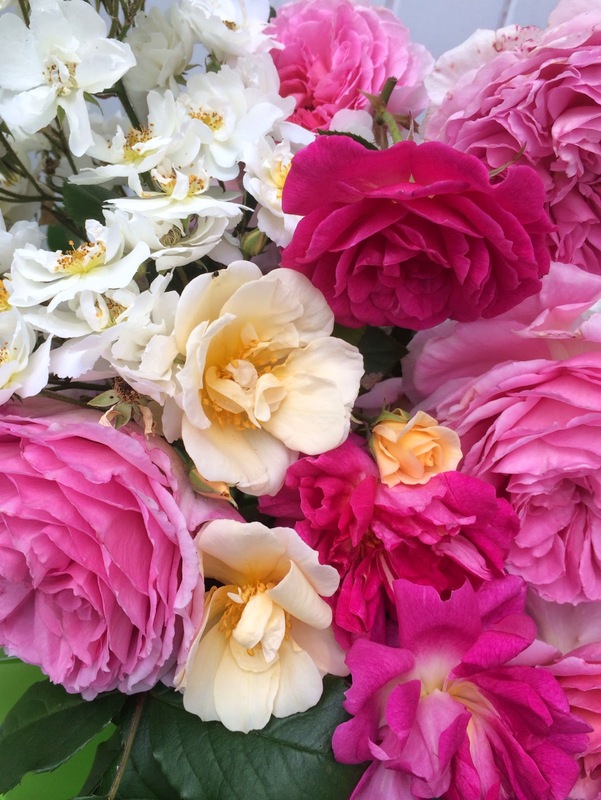 Plus you could go bonkers on the David Austin website, you cant go wrong there. I'm just about to plant a rose garden at the front of the house, so am avidly reading as much as I can about them. Your post is perfectly timed for me. I feel ashamed to admit it but I don't have a single rose in the garden, I shall just enjoy the beauty of yours Paul, wish I could smell them too. I would love to see YOU pirouetting through the garden!I danced for 15 years and so wanted to make it my career!Just not meant to be.Too tall and not good enough but I loved every minute I was at that dance studio!Now, tell me is there a post I might go back to see a snippet of MAGICAL MANOR?I would adore to see some receptacles and urns that you have collected over time................and THANK YOU for your lovely comment over at the VINTAGE HEN HOUSE!I am so honored you made my day!Many,many thanks. I am so glad somebody has given me a title at last Mr Loi. So without wasting anytime whatsoever I shall wade in with my favourite yellow climbers. Rosa Banksiae Lutea is stunning but I think she may engulf the poor house. Lady Hillingdon is very pretty but her weak neck can make her look ever so droopsome! Graham Thomas has those gorgeous custardy yellow blooms and classic tea rose fragrance. Lastly I must include the gorgeous Claire Jacquier, she is very special to us here at Magical. Glorious Egg yolk yellow buds open in sprays to reveal beautiful fragrant Crème Brulee centres. Rose shopping is just the best, have fun! I knew I could count on you :) Merci!! Merci!!! Paul, your magical prose and colorful roses have brightened a grey rainy day! I LOVE reading your posts and seeing what you are up to. You are one gifted and special man.Thank you for sharing your beauty! Paul, Finally had time to watch this little clip and it made my day! Had to watch it twice. I don't know how I have never seen Carousel, but have to watch it all now. Some really fun choreography there.. And those sailors! Your roses are beyond beautiful and I love an old-fashioned tumbling bouquet like that. Hope you are enjoying your London summer. Wish I was there it's horribly 100 and not nice.